"TO THE SHIRE!" 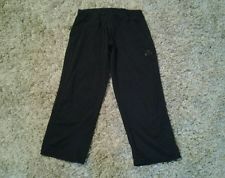 I often shout when folding the laundry and finding a pair of my short wife's capri-workout pants. But you won't find the word "hobbit" within The Complete Book of Gnomes & Halflings, because its maker, TSR Inc., didn't want to get sued by Tolkien's estate. 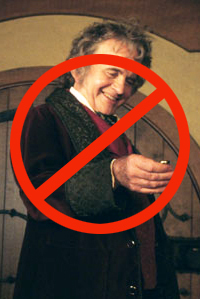 So instead they called them "halflings," a term just generic enough to get the job done. So let's refrain from using the "ho" word. What is TSR? TSR is the company put together by the makers of numerous tactical, strategic and role playing games, most notably Dungeons & Dragons. After a couple decades of building up the popularity of D&D, their flagship game, TSR decided to tweak the rules a bit and thus was born "the 2nd Edition". The 2nd Ed exploded the few core rule books of the 1st Ed into many shrapnel-sized supplemental rule booklets that were even more complex and more expensive. This one retailed at $20...and this was back in 1993! These slim books would've generated more cash for the company had they included more information applicable to the game. Too often the new info was just a generalized rehashing of old info, like tips on being a good dungeon master (game referee) or how to "play nice" with one another. Too much of it was filler and already covered in the core rule books from the 1st edition. The Complete Book of Gnomes & Halflings was my favorite of what I've read of the 2nd ed booklets. It expands upon the basic race details of the gnome and halfling, those diminutive cutesy folks so limited in stature but big on character. With this book, players were encouraged to take the gnome beyond the typical illusionist prankster and likewise gave the halfling more to do than playfully pilfer treasure horde baubles. The new racial subdivisions and sub-classes (meaning professions like warrior, wizard, thief, priest) provided here gave D&D players ideas and means with which to create more colorful and dynamic characters. However, this is where the unbalancing of the game came in. These new subdivisions/classes gave the characters skill bonuses and other extras the basic characters didn't have. It gave them a slight leg up. No doubt this was all by design. TSR very well may have been thinking that if enough players bought these new rule books and used these new, more skilled characters, it would entice the players with the old rules to plunk down the cash for the 2nd ed books. TSR may have started out as the altruistic brainchild of a '70s gamer, but a few years later the corporation had morphed into a greedy monster in the truest tradition of the '80s. Well, to be fair, we consumers were the ones greedily consuming whatever TSR put out. And why not? This game sparked the imaginations of countless kids. It turned some of them into expert game makers and novelists. Without D&D there might not be a Game of Thrones. How do I know? Because it turns out that George RR Martin was once a brilliant dungeon master.